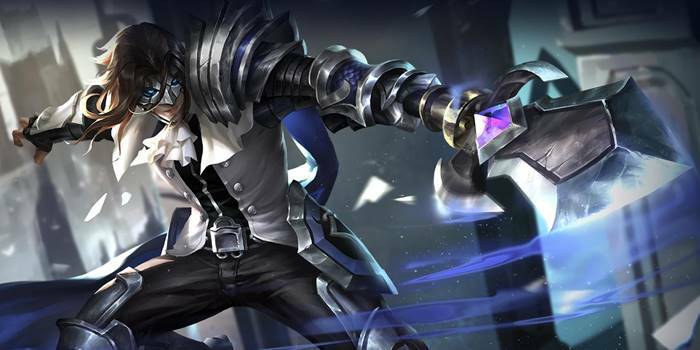 Guide for the hero Zanis, a character in Arena of Valor (AoV). Included are Zanis’s abilities, statistics, attributes, strengths, weaknesses, and more. These are Zanis’ attributes on the mobile version of Arena of Valor. Click here for his attributes on the Nintendo Switch version. Blood Wyrm deals damage to towers. Zanis strikes the ground, dealing 180/210/240/270/300/330 (+0.7 AD)ˀ physical damage to nearby enemies. If any enemy units are hit, Zanis attack speed will be increased by 100/120/140/160/180/200% and 10/12/14/16/18/20% life steal for 3.5 seconds. Zanis strikes the target, dealing 300/375/450 (+1.4 AD) true damage and knocking enemies into the air briefly (0.75s). For the next 5 seconds, his normal attacks deal an additional 70/110/150 (+0.35 AD) true damage. Does not toss up Epic Creatures (Dark Slayer, Abyssal Dragon, Spirit Sentinel). When in a group battle, cast Zanis’s Dragon’s Wrath first to control enemies, the use Blood Wyrm to increase his attack speed and finish them off. Our recommended order for Zanis abilities as he levels up. See all of Zanis’s item builds. When using Zanis for jungling, get 2nd skill first as his Blood Wyrm is useless against monsters because whats the point of the movement speed bonus? I am playing on the switch also on Mobile and I don’t see him lunching anyone in the air “briefly”, on their main youtube video about him they don’t mention that either. Hi, I just logged in the game right now and Zanis passive in game don’t have the “restores his maximum HP by 5%” per kill assist. Are the game details incorrect? I just observed it btw just wanna confirm hehe. Thanks!! While it is not listed on the SEA server, Zanis still receives the 5% HP whenever he kills an enemy. Someone probably forgot to change the text.